If you seek intense, in-depth, challenging coursework and instruction, my private bellydance classes in Orlando, FL are for you. Here we can discuss a myriad of topics outside of just technique and you can obtain honest critique from a judge and award-winning performer. You will grow stronger mentally, physically, and really dig deep into the “how” and “why” behind the Art form and your own hurdles. Weekly homework assignments and regular practice are mandatory. I teach from 4:30 pm-5:30 pm each day of the week (Mon.-Fri.), so if you are serious about improving your craft and taking your bellydancing to the next level, then read below. My bellydance classes in Orlando are on a first come first serve basis and require the student to be able to take bellydancing classes during one of those day/time slots. You can take classes in person or via Skype. * Exceptions are made for out of town dancers who are in Orlando for limited amounts of time. This course guides the student through technical, musical and cultural fundamentals in year one, all the way to professional performance by years 5-6. Did you say 5-6 years? Yes, learning an Art doesn’t happen in a day. My classes are geared towards serious students. We take things level by level. How long the program takes is dependent on the pace of the student. Classes can be taken live, via Skype or a combination of both. The goal is to create awareness, increase your knowledge of MENAT dance and culture, and create fluid and precise movement using Jennifer’s muscle-based approach. Creativity is a key theme we will explore throughout the program so that you develop your personal style. A syllabus for each level will be provided in order for students to plan homework assignments and practice time accordingly. 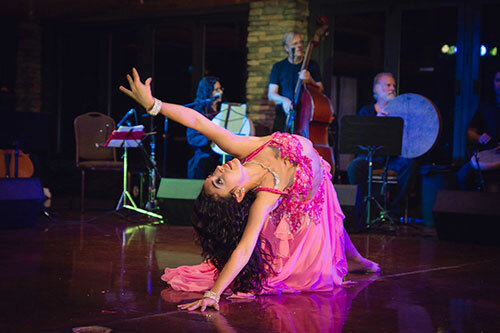 This 2-month course will give you a deep look into the 13 most popular rhythms in bellydance music, their application, meaning, practical use, and cultural nuance. If you have never taken a music class before, not to worry. Although Jennifer comes from a musical background, she has had much success teaching the basics of music to students and how to count rhythms. No more innocent mistakes, learn what to do when these various rhythms arise in your music! I would highly recommend Jennifer as an instructor. I first attended a workshop that she taught in West Palm Beach which was excellent. Then I had a private Skype lesson with her. She is a technical, thorough instructor. In my private Skype lesson, Jennifer covered all of the areas that I requested help with. Her wonderful sense of humor kept it fun. I was skeptical about using Skype, but since we don’t live close to each other, it was the best alternative. I was pleasantly surprised! It was as if she was in my living room and so convenient not to have to leave the house. Have an important competition coming up? Jennifer wrote the Book on Bellydance Competitions…literally (The Bellydance Competition Handbook) and can guide you through this challenging, yet personally rewarding journey. We focus on crossing your inner hurdles and breaking free from your own limiting beliefs. A trophy is nice, but dancing your best ever the day of competition is the focus. Intermediate level dancers: it is recommended to start this program 6 months before the competition. Professional level dancers, please register 3 months before competing. Learn the proper technique for a specific prop as far as different grips, arm positions and etc… once you have mastered that, the fun will begin as Jennifer pushes you to create innovative and creative shapes with them. Creativity is one of Jennifers’ signatures and is essential in breaking out of the box and showing true mastery. Have courage and try something new and become proficient in your desired prop once and for all! I know not everyone can attend my live classes due to distance or schedule conflicts, but thankfully, the internet has made it possible to study with me no matter how crazy your hours may be. Try a lesson. Go to one of my bellydance classes in Orlando, FL or learn online and see why so many of my clients are award winners themselves. Call (407) 900-8397 today.